A ‘kettlebell’ is a traditional Russian cast iron weight that looks like a cannonball with a handle. Due to their unique design and wide weight range, kettlebells allow for a variety of dynamic ballistic exercises that can be scaled to meet most fitness levels. The exercises are simple and can be easily incorporated into an exercise program. Kettlebell exercises incorporate the entire body and are designed to be time and energy efficient. 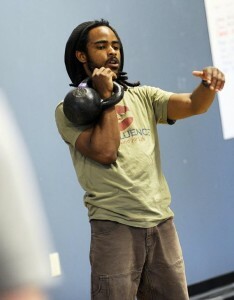 The Confluence has partnered with North Country Kettlebell to bring Kettlebell training under one roof. Trainer Abdul Mujib works with kids and adults at all skill levels to improve overall fitness and strength. Kettlebell Craze is a one-hour group class designed to provide intense Kettlebell workouts for participants of all skill levels. Workouts are intended to teach and challenge all participants while providing the education necessary for progression in their Kettlebell training practice. For the past five years, Abdul Mujib has trained extensively with Russian Kettlebells, and is a Level 2 Russian Kettlebell Challenge Certified Instructor. In addition to his own training, Mujib has established the first Vermont-based Russian Kettlebell specific training program. Monthly training plans include At-home Workout Design, Projected Program Goals and Progressions, Video Analysis, and Video Consultation. Three month Enrollment discount available.